After 54-year-old plantswoman Dirkje Boer died of cancer in 2002, her garden sank into grief along with her husband and three sons. The two and a half acres of flowers she had cultivated against the backdrop of surrounding dairy farms in the village of Dijkerhoek (about an hour and a half east of Amsterdam by car) quickly got overtaken by weeds. By the time Dutch-born landscape architect Ronald van der Hilst saw the property, its condition mirrored her surviving family members’: “It was like a bomb had exploded,” he told Architectural Digest. 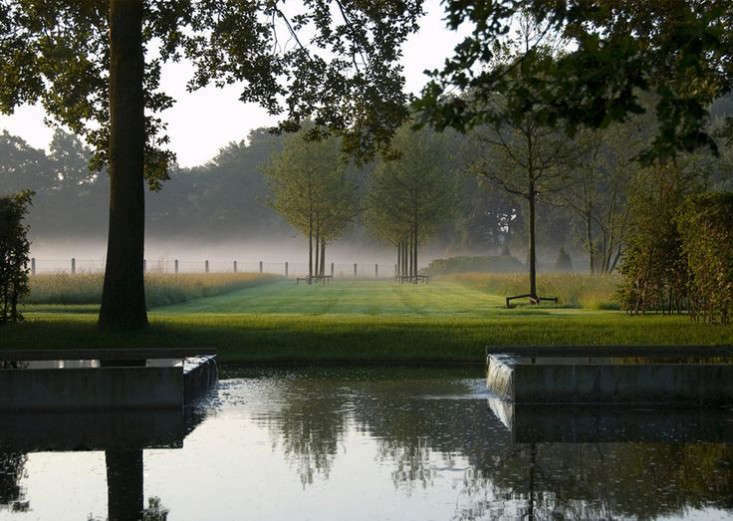 Above: For van der Hilst, the most exciting challenge of any landscaping project is to create the unexpected. Seeking inspiration after meeting Willem Boer, he returned to Antwerp and started to draw ideas while listening to music. Listening to Mahler’s Sixth Symphony, with its “strong rhythmic structure,” inspired the landscape architect to create a two-tiered reflecting pool shaped like a cross to anchor the center of the garden.